This PDF 1.4 document has been generated by Writer / LibreOffice 4.3, and has been sent on pdf-archive.com on 18/12/2014 at 18:13, from IP address 71.3.x.x. The current document download page has been viewed 343 times. File size: 91 KB (5 pages). 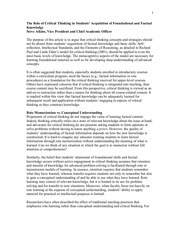 procedures) as a foundation for the critical thinking reserved for upper-level courses. thinking as they construct knowledge. Proponents of critical thinking do not impugn the value of learning factual content. material for practical or intellectual purposes is limited. be an efficient problem solver” (p. 190). Elements of Reasoning and Intellectual Standards from the teaching/learning process. within the larger conceptual framework to which they relate. All reasoning has a purpose. question, to solve some problem. All reasoning is based on assumptions. All reasoning is done from some point of view. All reasoning is based on data, information, and evidence. All reasoning is expressed through, and shaped by, concepts and ideas. All reasoning leads somewhere, has implications and consequences. the classroom, become internalized by students as questions they need to ask themselves. Schoenfeld as necessary for effective problem solving. This file has been shared by a user of PDF Archive. Document ID: 00199753.